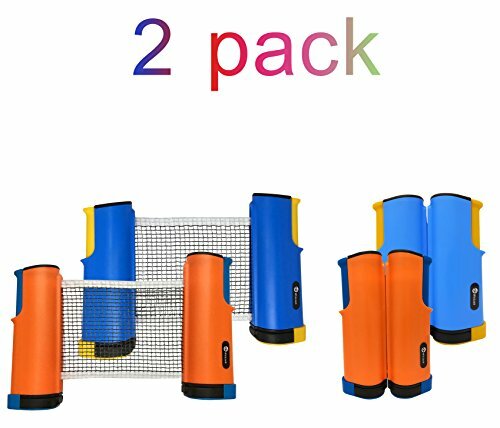 The two beautiful colors (blue and orange) of this product attract youth in ping pong sport. Lots of parents and school coaches bought this accessory. Our net set is also popular in senior centers, public play rooms / clubs, ... The colors are appreciated by both female and male. If you only have limited space, you can setup this retractable net on a mid-size table to play and train. We are manufacture and also table tennis product end-users, so we know what you need and care as an end-user. Our legs stand in your shoes and socks. We tested and improved our retractable nets countless times before we launched this product to the market for you. Your satisfaction is our champion trophy awards. Ping pong supplies are the only a few best fitness items to get Mom, Dad, grandma, grandpa, son, daughter, grandson, granddaughter, ... , all kinds of players involved to play hard or easy. Expandable elastic net is also a best premium toy for kids to play on a lightweight wood mini table top. With score-board and trainer, little kids are quick learner and can start playing ping pong from three years old (even from toddler age, not a funny joke) on a light tiny miniature short table in their comfort room. Spring Clip System - Super easy quick set up and take off in seconds. Simply clamp down the holder to install, pull net across the table, and have an instant fun game; weatherproof to play inside or outside. Designed to be used for practice / recreational; the net can be stretched to 6 feet across; lightweight mesh netting is expandable to a 60 inch full-size ping pong table for non-professional training and competition. Fits tables up to 2 inch thick. Net brackets can be clipped on almost any surface - Play ping pong on office desk or adults kids family entertainment on a home kitchen dining table. Turns almost any tabletop to play 5-star game with this universal attachment. Two most beautiful colors (orange and blue) attract girls and boys, teens and juniors. Automatic Retract for easy storage in a compact small kit. Cool nice cover case as a protector and easy carrying, play ping pong on the go. 60 day manufacturer money back guarantee and 100 day free replacement warranty to let you buy with confidence. Men and women, parents and grandparents, catch this space-saver equipment gear for your children, grandchildren, friends, ... , for birthday party gift, Thanksgiving, Black Friday, Cyber Monday, Christmas, New Year's Eve, Fourth of July, any holidays, reunions, ... Make the deal for you!